The last year has seen many exciting archaelogical finds throughout Israel, in and around Jerusalem, in the south and the north, the Galilee. Striking findings have been made in the City of David-Pool of Siloam [Silwan] area in Jerusalem which was within the ancient city walls of Jerusalem in the First Temple period but is now outside the Old City, south of the Temple Mount. 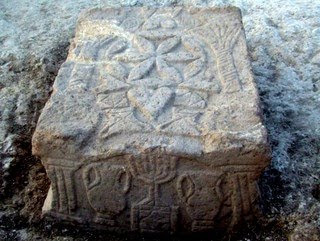 Here is a discovery of a carved stone from an ancient synagogue from Second Temple Times with a striking photo showing the an ancient menorah, candelabrum. That is, the carving is from the time when the Temple still stood and it depicts the seven-branched menorah used in the Temple. This menorah can be compared with the menorah carved in stone on the Arch of Titus in Rome, which is meant to show the golden menorah from the Jewish Temple in the hands of conquering Roman troops. I would say that the two menorot are fairly similar but not identical. What a difference the artist makes!! "A synagogue from the Second Temple period (50 BCE-100 CE) was exposed in archaeological excavations the Israel Antiquities Authority is conducting at a site slated for. . . construction. . . on Migdal beach [on Lake Kinneret, the Sea of Galilee]. . . In the middle of the synagogue is a stone that is engraved with a seven-branched menorah (candelabrum), the likes of which have never been seen. The excavations were directed by archaeologists Dina Avshalom-Gorni and Arfan Najar of the Israel Antiquities Authority. Note the carved stone slab with floral and vegetation designs on top and a menorah accompanied by a pitcher or jar on each side. Carved images of columns appear at the two visible corners. "The main hall of synagogue is c. 120 square meters in area and its stone benches, which served as seats for the worshippers, were built up against the walls of the hall. Its floor was made of mosaic and its walls were treated with colored plaster (frescos). A square stone, the top and four sides of which are adorned with reliefs, was discovered in the hall. The stone is engraved with a seven-branched menorah set atop a pedestal with a triangular base, which is flanked on either side by an amphora (jars). According to the excavation director, Dina Avshalom-Gorni of the Israel Antiquities Authority, “We are dealing with an exciting and unique find. This is the first time that a menorah decoration has been discovered from the days when the SecondTemple was still standing. This is the first menorah to be discovered in a Jewish context and that dates to the Second Temple period/beginning of the Early Roman period. We can assume that the engraving that appears on the stone, which the Israel Antiquities Authority uncovered, was done by an artist who saw the seven-branched menorah with his own eyes in the Temple in Jerusalem. The synagogue that was uncovered joins just six other synagogues in the world that are known to date to the SecondTemple period”. "According to the Minister of Culture and Sport, MK Limor Livnat, 'This important find attests to the extensive Jewish settlement in the northern region at the time of the Temple. I am certain that the site will . . . shed light on life in the Jewish settlement [of Migdal] during the Second Temple period'. The site is legally the property of a subsidiary of the Franciscan Order who were assigned for centuries by the Vatican to watch over Roman Catholic church interests in the Land of Israel, caring for Catholic pilgrims and Catholic interests in the Christian holy sites as against Greek Orthodox and other Christians. The Order's delegation in the country was called the Custody of the Holy Land, Custodia Terrae Sanctae, in their lingo. The Franciscans intend to build a hotel on the site which may also serve as an ecumenical center for "dialogue" in today's fashionable terminology. This would be a welcome change from the old days when the Franciscans were known for their bigotry and intolerance, especially toward Jews, including in the Land of Israel.